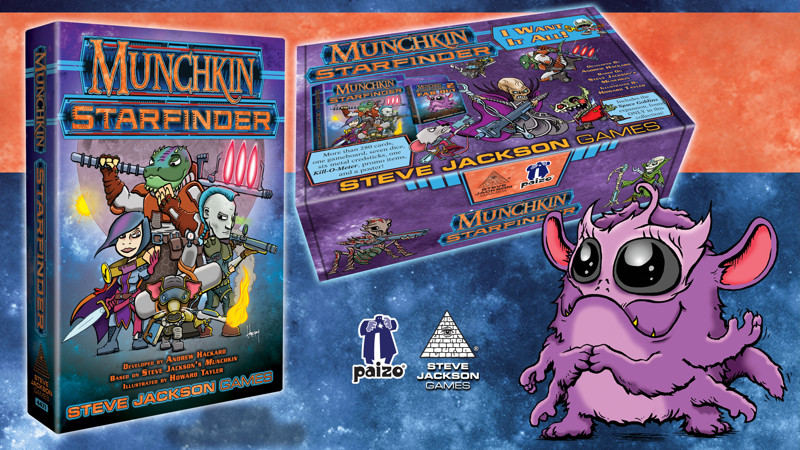 Daily Illuminator: Munchkin Starfinder In Stores! September 5, 2018: Munchkin Starfinder In Stores! It's time to shoot for the stars – Munchkin Starfinder is in stores now! This new version mixes classic Munchkin gameplay with the awesome world of Paizo's hit Starfinder RPG. Munchkin Starfinder is available as a standard core-sized game, but you can show your mettle and go all-out with the I Want It All box as well. This box contains the base game, Munchkin Starfinder 2, Space Goblins, the Hero Pack, The Swarm, Credsticks, Drift Dice, a Kill-O-Meter, Star Field board, and more! We fit as much as we are legally allowed inside the box, so we snuck a special bonus rule onto the box itself. (We did it because we love you.) If you love Munchkin or Starfinder, this box has everything you'll ever want. Every card is lovingly crafted by Munchkin Czar Andrew Hackard and illustrated by Howard Tayler. Howard has a long history of sci-fi with his own Schlock Mercenary webcomic, so his style is perfect for this game. Hackard and Tayler. Paizo and SJ Games. Munchkin and Starfinder. Get this all-star pairing now at your local game store, or on Warehouse 23! You'd be out of this world to miss it.